BBMP Election going to be happen on 28th March in the Silicon Valley of India. The SEC is going to make use of the technology this election in all the 198 Wards this election. 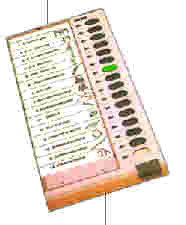 BBMP is going to use the Electronic Voting Machine (EVM) for all the 198 wards this BBMP Election. To cast your vote right and know the functionality of the Electronic Voting Machine (EVM). Voter will be called by name as usual to put his signature on Voting Register. Electoral Officer will put special ink on his finger as usual. Electoral Officer will hand over a slip containing voter’s serial number as shown in the Voter Register. Voter will hand over the slip to Presiding Officer . He will satisfy himself about the genuineness of the particulars of the voter. After all these formalities, voter will be asked to reach at Electronic Voting Machine kept in a corner covered from sides to maintain secrecy of the vote.